Use a Spreadsheet and Statistics to Better Understand Your Data | Spreadsheets for the People! The spreadsheet functions covered in this tutorial are: average(), median(), mode(), min(), max(), counta(), stdevp(), stdev(), percentile(), countif(), countifs(), and skew(). 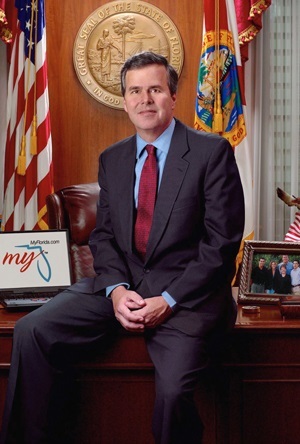 “Gov Jeb Bush” by State of Florida – official Florida website – myflorida.com. Licensed under Public Domain via Wikimedia Commons. This tutorial draws from this spreadsheet containing data on contributors to Jeb Bush’s gubernatorial campaigns in 1998 and 2002. I compiled it from data downloaded from the National Institute on Money in State Politics. As I write this, it is a near-certainty that Jeb Bush will enter the 2016 race for U.S. President. Other than being from a famous family, he is known for having been Governor of Florida from 1999 to 2007. This tutorial shows you how to summarize and analyze this contribution data with the goal of transforming it from mere data into useful and meaningful information. I usually approach data sets by reviewing how it is put together. I pay close attention to column titles and the values contained underneath. I often delete columns that are not necessary to my calculations or analysis so as to keep my data set as lean as possible. The spreadsheet I created for this tutorial is the result of that process. And, having reviewed the data, I decided to focus on contributors and the amounts donated. When analyzing numeric data, I typically start by focusing on, what I believe to be, an important variable and then finding various ways to summarize the entire set of corresponding values. This tutorial uses records of contributions to Jeb Bush’s gubernatorial campaigns. I have decided that the single variable most important for study is contribution totals. I would like to summarize the entire set of contribution totals with one single number, an average. The number of contribution totals found in the data set is large. Let me next summarize these donations by finding the center of them all. There are several ways to convey the idea of centrality. The most common ways are mean, median, and mode. These functions translate to average(), median(), and mode(), respectively when using a spreadsheet. If you want to learn more about mean, median, and mode, I recommend StatisticalPractice.com. The first column shows the formula syntax. The second column shows the result. The functions average(), median(), and mode() each have the same argument – a range of cells. In this example it is G2:G39482, which is titled Amount, and is located in this spreadsheet. I will next get a better sense of the size and extent of campaign contribution totals. Three similar spreadsheet functions will allow me to find the sample size and the range of values. What are the minimum and maximum dollar amounts given by contributors? The functions, min() and max(), will answer these questions. The functions min() and max() each have only one argument – a range of cells. For this example, I used the range G2:G39482, which points to a column titled Amount found within this spreadsheet. The function counta() counts all cells in a range that are not empty. The range of cells in this example is A2:A39482. This range is in the column titled Contributor:id in this spreadsheet. The idea behind using counta() in the example is this: since Contributor:id contains non-duplicate identification numbers that correspond with each contributor, I simply took a count of non-empty cells to find the total number of unique contributors. I now know that 39,481 contributors gave Jeb Bush’s 1998 and 2002 gubernatorial campaigns donations totaling anywhere from -$500 to as much as $4,798,785. The median donation total was $500 and the mean was slightly lower at $485. Note that the center of the set of contribution amounts is not located anywhere near the mid-point of the range -$500:$4,798,785, which would be somewhere around $2.4 million. Instead, I found that the set of 39,000+ donation totals centers around $500. Do you remember the classic bell curve, also known as a normal distribution curve? It illustrates predicted observations of data, assuming the data has normal distribution. 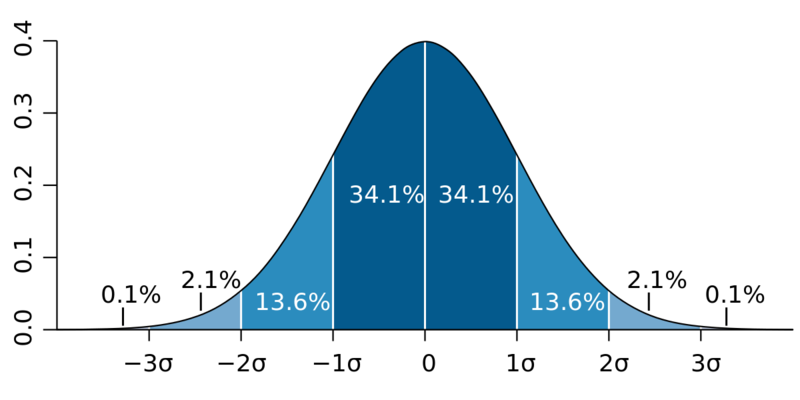 The mean, median, and 50th percentile are the same in a normal distribution. It is around this central value that the bulk of observations are found. In fact, 68.2% of observations within a normal bell curve are expected to fall within +/- 1 standard deviation (SD) from the mean. Ninety-five percent (95.4%) of observations are expected to fall within +/- 2 SD. If you want to brush up on percentiles, standard deviation, or a normal distribution, I recommend StatisticalPractice.com. Do contribution totals vary much? I will next use the spreadsheet function stdevp() to calculate the standard deviation for the population. The functions stdev() and stdevp() both use the same argument – a range of cells. In this example the range of cells is G2:G39482. The function stdev() is used when dealing with a sample, while stdevp() is used when dealing with a population. 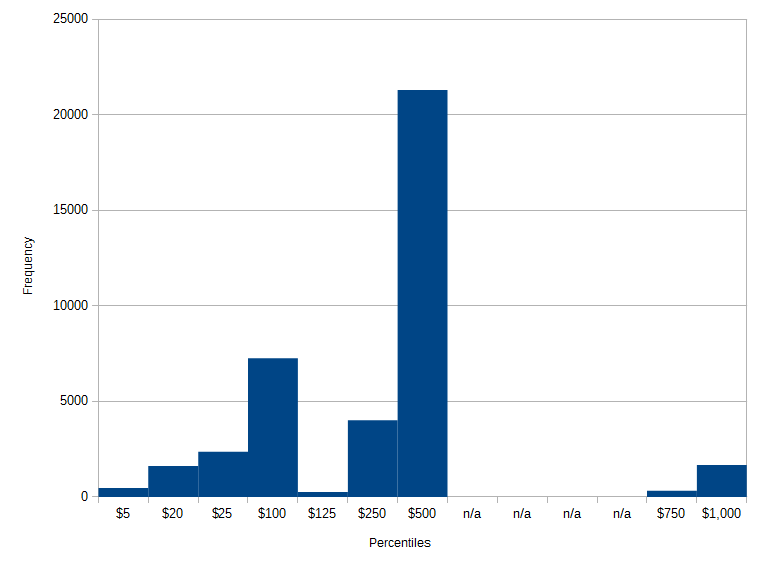 As the table shows, the standard deviation for the contribution totals of the population of 39,000+ donors is +/-$24,150. This is a very large number, particularly when compared to the mean, which is $485. I can conclude that contribution totals to Jeb Bush’s 1998 and 2002 gubernatorial campaigns have a lot of variability. If you think about it, the only way for the set of 39,000+ contribution totals to be distributed normally, with the mean and standard deviation being what they are, would be for them to be distributed within a remarkably flat bell curve. From standard deviations to dollars. Standard deviation helps provide a picture of how data is distributed around a central value. The median ($500) is used in this example. The first column lists standard deviations. The second shows the formula syntax. The third column shows the result. The arguments in the example start with a reference to cell J18. It contains the median value $500. The second cell referenced in each argument, J53,J54,… J59, contains a number of desired standard deviations -3,-2,…, 0,…, 3 as shown in the column titled Standard deviation (SD). The final reference M14 contains the standard deviation $24,150. I have found certain summary statistics for the set of contribution totals to Jeb Bush’s gubernatorial campaigns, including sample size, range, center, and degree of variability. I know that campaign totals are highly variable, but let me next look at their distribution. This table illustrates the spreadsheet function percentile(). The first column lists each percentile calculated. The second shows the formula syntax. The third column shows the result. The function percentile(), has two arguments. First is the range of cells. The second is the desired percentile itself, as a percent in decimal format. For example, even though you may want the 40th percentile, you would enter 0.4 rather than 40 as the second argument for percentile(). Let me review the first few percentiles listed in the table. At the first percentile, the bottom 1% of the set, contribution totals are less than or equal to $5. At the fifth percentile, the lowest 5% of the data set’s values, totals are $20 or less. At the tenth percentile, the bottom 10% of observed contribution totals from 39,000+ donors, the maximum is $25. By calculating the maximum values for the percentiles in the example above, I created classes or categories, ideal for graphing. What remains is taking a count of the number of contribution totals that fall within each class. The first column lists a percentile. The second shows the formula syntax. The third column shows the result. The function countif(), has two arguments. First is the range of cells from which you would like to count something. The range of cells in the example is G2:G39482. The second argument is the criteria, the something that you want to count. The function countifs() works much the same way, except that you are not limited to a single criteria. Each criteria should be preceded by a range: COUNTIFS(range1, criteria1, range2, criteria2, …). Now that I have made a frequency table, a histogram is not far behind. A quick conversion back into dollars may help remove a level of abstraction. Let me start laying out a series of observations. A good method is to look for departures from the ideal normal distribution curve. A great resource, which I found very helpful for this section in particular, can be found at StatisticalPractice.com. Symmetry: The distribution is not symmetrical. The tail on the right is much shorter than the left tail. Tail length: I cannot say that the data is short- or long-tailed, since it is not distributed symmetrically. The left tail is certainly much longer than the one on the right. Outliers: While not shown in the histograms, there is a single value that is far removed from other observations. This was found earlier to be $4,798,785. As a comparison, note the that the maximum value at the 99th percentile is $1,000. Modes: The set of contribution totals does not seem to have a normal distribution with a single peak at the center. Instead, the data appears to have a multimodal distribution. Skew: The data is skewed to the right. It has a positive skew. Your spreadsheet can calculate skew using the function skew(). A positive number indicates a skew to the right, a normal distribution has a skew of zero, and negative number indicates the data is skewed to the left. The function skew(), has one argument, a range of cells. The example uses G2:G39482. The result 198.66 confirms the earlier observation that the data of contribution sums made by over 39,000 donor to Jeb Bush’s 1998 and 2002 gubernatorial campaigns are skewed to the right. The data used for this tutorial were contribution records for Jeb Bush’s 1998 and 2002 campaigns to be Governor of Florida. The sums given by 39,481 contributors to Mr. Bush’s campaigns ranged from -$500 to as much as $4,798,785. The most common sum was $500; it was also the median. The mean was slightly lower at $485. Contribution totals to Jeb Bush’s gubernatorial campaigns were highly variable. The standard deviation was +/-$24,150. The distribution of values is not symmetrical. There appear to be three distinct clusters at approximately $100, $500, and $1,000, although the median value of $500 is most predominant. The data, contribution totals, are skewed to the right. It is safe to say that it does not have a normal distribution. One outlier stood out. It was $4,798,785 in donations made by the Florida Republican Party. This is over 9,000 times the size of the median sum of $500. If you look closely at the spreadsheet I created for this tutorial, it includes an outlier of $4.8 million, a contribution total of -$500, and over 80 contribution totals of $0. What if we excluded these from our analysis? What might the results look like then? Well, I did exactly that. To start with, the median and mode remain unchanged, but the mean decreased to $364. The presence of a single contributor’s total of $4.8 million had so much influence on the mean that it was $485 when I included it in the set previously. The minimum sum that a contributor donated was $1. In fact, 52 contributors each gave a total of $1 to Jeb Bush’s 1998 and 2002 campaigns. The maximum contributor total dropped to $11,077 once we excluded the outlier. This new maximum contributor total is 22 times the median sum of $500, compared to over 9,000 times previously. Contribution totals to both of Jeb Bush’s gubernatorial campaigns were still highly variable, even after excluding outliers. The standard deviation was +/- $270, which is more than half of the median and almost 75% of the average. 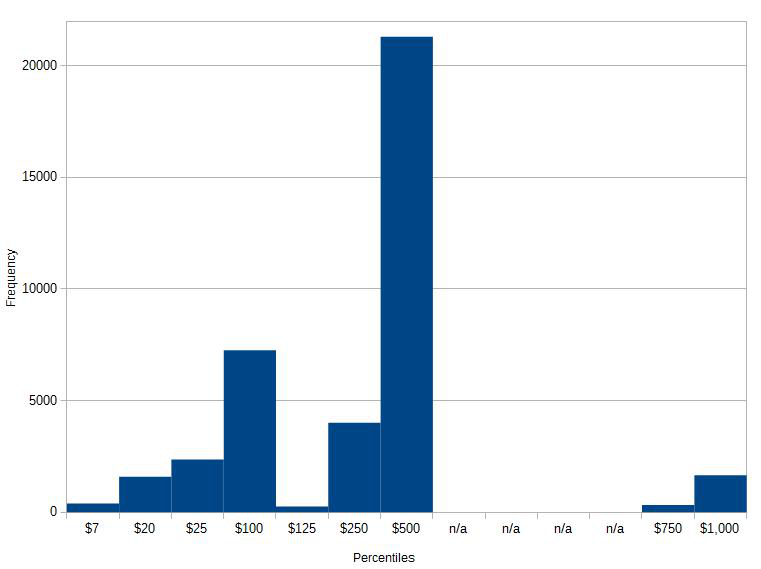 The histogram showing frequency of contributions at various levels looks much the same as it did earlier – not very symmetrical and with clusters around $100, $500, and $1,000. Contribution totals are skewed to the right. Did this tutorial work for you? Is it clear as mud? Did you find errors? Do you want to add your own interpretations or observations of the data? Show some love! Ask questions, leave a comment, or simply share this with someone you know would really benefit. If you find yourself in a pinch, you should know that I am available to help with spreadsheet projects. This entry was tagged average(), count, counta(), countif(), countifs(), frequency, histogram, max(), mean, median(), min(), mode(), percentile(), range, skew(), standard deviation, statistics, stdev(), stdevp().